Happy Holidays. This week is filled with holiday festivities, including several tree lightings around the city. But that’s not all. This Sunday, December 6 is also the first evening of Hanukkah. This week, we’re learning about a Young Charles Dickens at Theater 3, listening to lots of live music at tree lighting parties and enjoying the classic story of Snow White. One show to look out for is Pedal Punk. This performance features steampunk acrobats that will surely delight kids of all ages. Here are our picks for the week ahead. For New Yorkers and tourists, one of the big signs of the holiday season is the lighting of the Rockefeller Center Christmas Tree. This is a massive celebration that takes place between West 48th and West 51st Streets and Fifth and Sixth Avenues. The event features several performances. Mary J. Blige, Sting, James Taylor, Pentatonix, Andy Grammer, Carly Rae Jepsen, Band Perry and Andrea Bocelli are all scheduled to perform. This event is free and open to the public, but you’ll have to get there early if you want to be close to the festivities. The event runs from 7PM to 9PM on December 2. You can also catch it at home at 8PM on NBC. The tree will remain lit through January 6, 2016 at 8PM. Lincoln Square’s 16th Annual Winter’s Eve festival will kick off on Monday, Nov 30. The event features music, food and dancing for all ages. Kids will be happy to see jugglers, stilt walkers and other fun performers. The festivities begin at 5:30PM with the lighting of the Upper West Side Holiday Tree in Dante Park at Broadway & 63rd Street. Local and neighborhood stores will also be food tastings, which cost $1 to $4. The event runs through 9PM. If you planned on going ice-skating in Bryant Park on December 1, think again. The ice skating rink will be closed between 1PM and 7PM for a grand celebration! 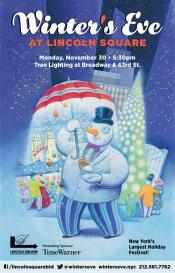 Bryant Park will host its Tree Lighting Skate-tacular show at 6PM at The Rink. The show will include an original story, called “The Lights Before Christmas.” This skate show will feature Nancy Kerrigan, Brian Boitano, Johnny Weir, Davis & White and the Haydenettes. Don’t worry ice skaters! The rink will be open after the show for public skating to live music from the Jazz at Lincoln Center Orchestra. Why watch a tree lighting in midtown, when you can enjoy one by the seaport? The South Street Seaport will host its annual tree lighting on Tuesday, December 1. This is a great way to kick off Giving Tuesday. Families can also take photos with Santa at the Seaport Studios, located at 19 Fulton Street on the second floor. Santa will take a break from photos at 7PM to join in the lighting countdown. The event will feature live music from the Milestones (an a cappella group), singer-songwriter Connell Cruise, the Mariners’ Temple Baptist Church choir and American Idol winner Nick Fradiani. The event runs from 5PM to 8PM. Brooklyn families can kick off their weekend with a tree lighting right on Atlantic Avenue. On Friday, Dec 4, you can enjoy a tree lighting at the St. Cyril of Turov Belarusian Church (401 Atlantic Avenue at Bond Street). The event runs from 6PM to 8PM. However, if you take your children out a little early, you can enjoy caroling from 5PM to 6PM with the Brooklyn Youth Chorus and the Mark Morris Dance Group’s Hard Nut Singers. Other performances throughout the evening will include a violin ensemble from the Brooklyn Conservatory of Music, Brooklyn Ballet’s Pop Opera Vocalist and tap dance by Brooklyn Public School 38. This is a great community event to join in. Instead of taking in a classic rendition of Tchaikovsky's Nutcracker, families can simply enjoy a puppet adventure into the Land of Sweets. On December 6, the Morgan Library and Museum will host The Steadfast Tin Soldier: A Puppet Show. This puppet show is presented by Puppetworks. The story is adapted from Hans Christian Andersen’s The Steadfast Tin-Soldier. It centers on an epic battle between a jack-in-the-box and a one-legged tin soldier rages in a nursery. It’s a battle of love, jealousy, and deception to win the heart of the ballerina doll. There are two shows, beginning at 2:15PM and at 3:30PM. Each show is just under thirty minutes. Get ready for the greatest play ever. Well, that’s one brave little kid believes. 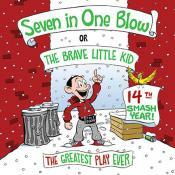 On December 4, “Seven in One Blow” opens up at Axis Theater. This is the Axis Company’s annual winter show for children. This interactive show is designed for kids ages four and up. “Seven in One Blow” is adapted from the classic fairy tale by The Brothers Grimm. It blends advanced technology with live performance. Tickets are $15 for adults and $5 for kids. Shows are on Friday at 7PM and Saturdays and Sundays at 3PM. There will also be an additional Tuesday night show on Dec 22n at 7PM. The show runs through December 22. Get ready NYC. Las Vegas is coming to town. On December 4, Pedal Punk opens up at the New Victory Theater. This unique circus show from Las Vegas based Cirque Mechanics is something of a steampunk adventure for families with children ages five and up. It features lots of high-flying trampoline tricks, but that’s not the biggest draw. The show includes a 20-foot high, pedal-powered mechanical masterpiece that the performers will use to execute aerial stunts. They will also transform a bevy of bikes into an astounding assortment of acrobatic apparatus. This is definitely one high-octane show to get the adrenaline pumping for the holidays. Pedal Punk runs through January 3, 2016. 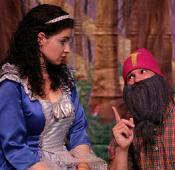 On Dec 5, Snow White opens up at the Galli Theater. In this classic fairy tale, Snow White’s stepmother discovers that she is no longer the “fairest of them all.” She concocts a plan to get Snow White out of the way. There is a show on Saturday and Sunday at 2PM. The show is designed for ages 5 and up. Tickets are $20 for adults and $15 for kids. The show runs through January 17. The Galli Theater is a staple of children’s theater in the city. If you want to support the arts and also enjoy an afternoon of children’s theater with your kids, this is your chance. Sure, you’ve heard the story of Scrooge, Tiny Time the ghosts of Christmas. But have you heard the story of Young Charles Dickens? On December 5, you can see Young Charles Dickens performed by the NYC Children’s Theater at Theater 3. This play follows a 12-year-old Charles Dickens with a gift for telling stories. However, it wasn’t until he had to spend a year supporting his family, working on Christmas Eve, that he realized just how important his stories could be. Based on the true story of Charles Dickens’s childhood, Young Charles Dickens is the uplifting story of how one of the most famous writers of all time found his calling. Tickets cost between $25 and $45. The show is ideal for children ages 8 and up.